Jack Hanton was training fighter pilots at a military base in Van Nuys, California, in January 1945, when he was reunited with the plane he had named for his wife when he was a new pilot in the Army Air Forces. He had last seen it 18 months earlier in Sicily, when it seemed destined for the scrap heap after being shot up. 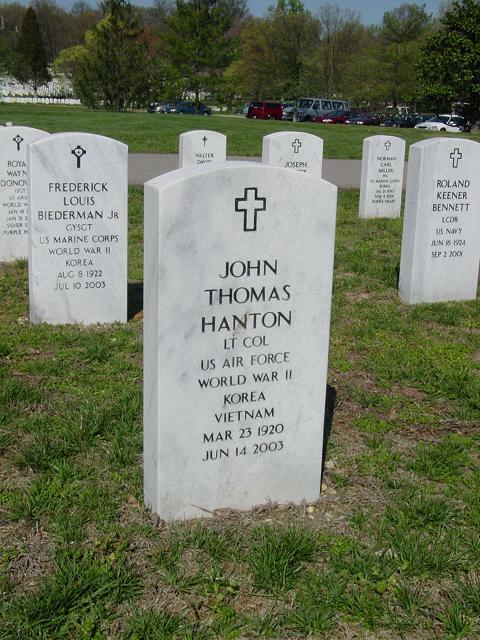 Hanton, who grew up in Minneapolis, will be buried Tuesday at Arlington National Cemetery in Virginia. He died of complications from lung cancer on June 14 at his home in Malibu, California. He was 82. Born in Vancouver, British Columbia, he came with his family to Minneapolis when he was 3. He worked at odd jobs while attending Central High School, which meant he could afford a car -- a rarity for a student in the Depression years of the late 1930s, said his son Thomas of Falls Church, Virginia. Flying had been a longtime passion, so he was paying for private flying lessons, too. After the war broke out, he joined an aviation cadet program in early 1942. That same year, he married his high school sweetheart, Catherine Schatzlein, daughter of the owner of Schatzlein's Saddle Shop in Minneapolis. She is now known as Kay, but when Hanton was flying P-38 Lightning fighters out of North Africa in support of the Allied invasion of Italy, he used a different nickname for the plane he had been assigned in June 1943 in Chateau Dun, Algeria. He painted "My Kathy" on the side in tall white letters, with his name below: "Pilot Lt. John T. Hanton." During the war, he won two Distinguished Flying Crosses, always given for a single event, said his son -- like the day in October 1943 when he downed a German Messerschmitt 109 and dispersed three enemy ships that were bothering U.S. bombers over Italy. He also won 11 Air Medals, given during World War II for sustained activity or for single events, Tom Hanton said. The day Jack Hanton lost "My Kathy," in August 1943 he was halfway across Italy to strafe German air bases in the area of Foggia when he had engine trouble. After turning back, he caught flak and machine-gun bullets as he shot up a train on the west coast. He put out a fire in one engine, then nursed the P-38 to a landing in Sicily. Eighteen months later, a student pilot at Van Nuys told him that one of the training airplanes was marked with his name. When Hanton checked, he found "My Kathy." "How it ever got all the way to Van Nuys and our P-38 [unit], I'll never know," Hanton wrote. "It sure took great care of me." He stayed in the military until 1968, his last several years serving as an Air Force adviser at the Rand Corp. in Santa Monica, Calif. His job was to coordinate and assess Navy and Air Force operations during the Vietnam War, including reconnaissance, resupply and attack missions, said his son. After leaving the Air Force, Hanton flew for a commuter airline in California and then for a corporation. In addition to his wife, Kay, and son Tom, survivors include another son, Steve of Agoura Hills, Calif.; daughters Johanna Edmonds of Annandale, Va., and Susan Whitney of Hampton, N.J.; six grandchildren; two great-grandchildren, and a brother, Carl Olson of Minneapolis.